When you are fearless, you are free! Life’s arduous situations can break you physically, can make you immobile, can cripple you – but they cannot break your spirit, they cannot puncture your conviction, if you simply choose to remain strong from within! But how do you remain strong from within when there’s absolutely no respite from the outside? Say, when your Life is hanging by a thin thread owing to a terminal health condition, or when you are caught in a legal maze and there’s no way out, or when your business has gone bust and you simply don’t have any money to even meet your daily needs, or when your separation from your spouse has drained you emotionally, financially, physically and you have lost your will to live? Where do you draw strength from in such, and other debilitating, circumstances, where you are consumed by fear, self-doubt and hopelessness? Interestingly, you must leverage your fear to gain courage. Courage is not the absence of fear. It is what you get by looking your fear in the eye, by accepting it, and deciding to face it. In reality, a courageous person is also fearful of consequences that logically appear to be on the horizon. But while she or he is fearful from within, she or he is able to pull herself or himself together on the outside. A coward, on the other hand, is both fearful from within and on the outside. But if you can leverage your courage, while becoming more aware, you can attain fearlessness. 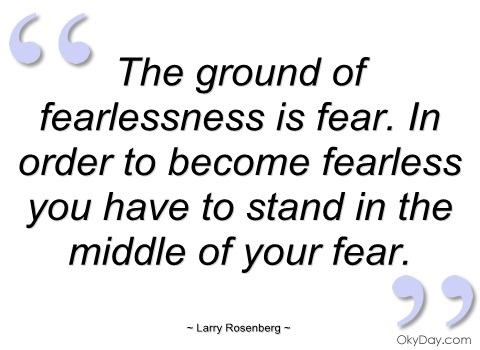 And fearlessness is not an outward emotion. It is the complete attainment of freedom from fear – within! That will happen, that can happen, only when you realize the true nature of your inner being. When you know that your soul is untouchable, unbreakable and immortal. Let’s understand this better. All the world’s scriptures talk of this truth. Yet why do you still fear things, people, events in your Life, despite perhaps, knowing and believing this doctrine to be true? Because you haven’t allowed your inner being, your soul, to experience this truth. Examine all your fears. They are always about losing all that you already know as impermanent – your job, your money, your health, your relationships! What kind of intelligence are you, the much educated you, displaying when you are fearful of threats to any of these impermanent aspects of your Life? Someone says you will die because of your health condition – and you are afraid of death? Someone says she will leave you for whatever reason – and you are afraid of losing her? Someone says you will be sacked for non-performance – and you are scared of unemployment? Someone says you will be convicted and sentenced – and you are afraid of imprisonment? But aren’t you already imprisoned, held hostage, by your fear(s)? Think deeply about this. Everything about your Life so far and the rest of your Life will be taken away from you sooner or later. If it is the fear of losing all that you hold on to that’s keeping you anxious, agonized and fearful, then know that your fears are fully justified. What you fear most will surely happen to you. Sooner or later. Including your death! It is only when you experience this realization, this awakening, at the core of your inner being, in your soul, will you be free from fear. Will you be fearless from within. Will you be free. Review whatever’s making you insecure. Focus on what you fear. And peel away each fear by asking yourself, ‘So what if this (that which you fear most) happens?’ When you get an answer to this question, ask yourself this question again, in the context of your answer, and so on. Keep going until you have no more answers. For instance, ‘What will happen after I die?’ does not have an immediate known answer. Yes, conjecturally, from what the scriptures tell us, the answer could be that ‘your soul is set free’. And so what if the soul is set free? Or if it is trapped somewhere, someplace? Will it matter to the person that you are currently? Since it won’t, why labor over your fears? So, whatever be the situation confronting you just now, don’t resist it, simply accept it for what it is. And know that since your spirit can never be broken or taken away from you, anything that’s happening to you, therefore, is not at all relevant! So be fearless. Be free! Author AVIS ViswanathanPosted on July 19, 2013 March 14, 2016 Categories Art of Living, Fear, Fearlessness, Freedom, http://schemas.google.com/blogger/2008/kind#post, Inner Peace, Intelligent Living, Soul, SpiritLeave a comment on When you are fearless, you are free!